The culminating adaptation project in the Bullocks Wilshire building involved the Dixon Center that now occupies the east wing of the first floor. 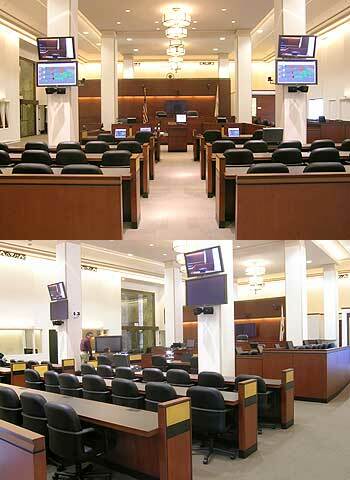 The restored historic Accessories space serves as a spectacular setting for the new technology-enhanced jury trial or appellate courtoom and advocacy/ alternative dispute resolution suite that feature the most advanced audiovisual, digital, and multimedia systems designed for courtroom and dispute resolution use.The custom built cherry and black ebony casework has been carefully inserted into the period architecture so it could be removed without damage to the restored walls and columns. Acoustic panels have been integrated into the decorative wall pattern and new lighting enhances the architecture and sets the specific scenes.